Letters and numbers and acronyms, oh my! RV: Recreational Vehicle. Technically, any vehicle that’s designed specifically for recreation, but usually means something to do with living out in the wild. MH: Motorhome. 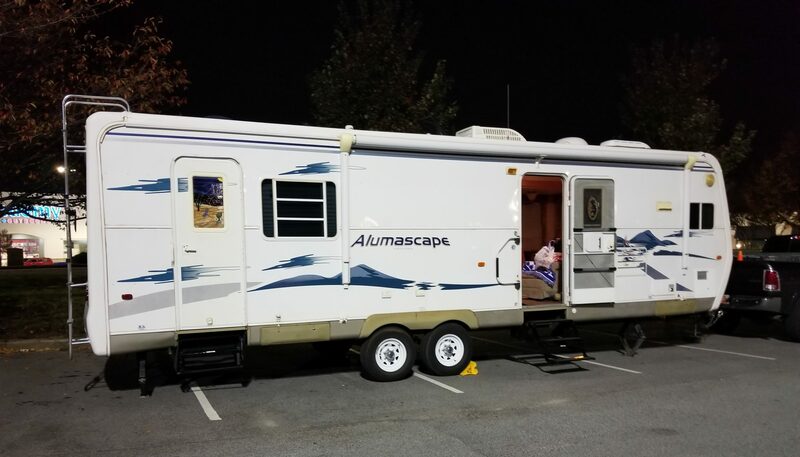 A unit that you drive, camp in, and enjoy life with. TT: Travel Trailer. This is a unit that you tow with another vehicle, usually known as a ‘Tow Rig’. Another post about towing. Bumper Pull: This is a trailer that you pull with a ball connection behind your truck, attached on, or near, the bumper. Fifth Wheel: This is a trailer that connects using a pin on the trailer, and a plate on the truck. You’ve probably seen a lot of these on tractor trailers all over the place, but they’re also popular in the RV world. By placing the tongue weight directly over the rear axle, you gain more control, and a higher tongue weight capability. Gooseneck: This is a trailer that works much like a Fifth Wheel, but instead of a pin and plate, the Gooseneck has an arm that sits down on a ball mounted in the bed of the truck. Gooseneck trailers are most common in Agriculture use, and allow a higher tongue weight, and better control, by placing the tongue weight directly over the rear axle. TOAD: This is a car that’s towed behind a Motorhome, not on a trailer of any kind. Tow Dolly: This is a two-wheel, short trailer that’s designed to have one end of a car on it, but the other end of the car rolls freely on the ground behind the trailer. Car hauler: This is a longer trailer, usually with two axles, that’s designed to tow a car completely off the ground. Enclosed trailer: This is a trailer that’s fully enclosed, like a box trailer, and can be used for a wide variety of purposes. Sometimes people will haul cars or motorcycles in these, other times they’re just for carrying extra stuff on the road. Especially handy for full time RV’ers. There’s several different types of camp sites, camp grounds, and connections for these. A camp SITE is the individual site where you set up camp. A camp GROUND is a collection of camp sites, and often include other amenities such as bath houses, laundry, a pool, and other such facilities. Primitive Camping: These are camp sites without any kind of connections. Great for boondocking, sometimes these sites aren’t even level or groomed in any way. Improved Camping: These are camp sites that offer some kind of hookups. For tent sites, it’s usually just power and water, but for RV’s, we’re usually talking power, water, and sewer. Power can be 20, 30, or 50 amp service, and sometimes there’s a combination of two, or even all three, at one spot. When you call ahead or check out the website for a camp site, make a note of what power options that have available. (Another post on amp numbers). Water connections are usually just a standard garden-hose style spigot, just like you’d find at home. Sometimes you need a pressure regulator, but we’ll talk about that in another post. Sewer connections are really nice to have, especially when you’re going to stay in one place for awhile, so you can dump your waste tanks any time you want. Most of the time this is a 4″ white (or black) pipe with a threaded fitting on the end that you screw a connector into, and then connect your sewer hoses to. Some campgrounds have local cable channels available through a cable connection at your site. If they it, you can use a regular TV cable to connect your rig to the campground connection.